Read this if you have an elderly at home – Stroke(s) can be fatal! An episode of stroke occurs when there is a sudden and life-threatening loss of blood flow to a part of the brain that results in damage or death of brain cells. The stroke may lead to irreversible damage and disability or for fortunate cases, the patient may still be able to recover all or most of his/her abilities. To put it simply, a stroke is an attack on the brain. For Americans, stroke is the third leading cause of death. Immediate medical attention is vitally important to the stroke patient, and the patient should be seen by medical professionals, preferably in a hospital, within an hour of the onset of the symptoms. Patients who suspect they have stroke or are exhibiting symptoms of stroke should never attempt to drive themselves to the hospital. They should preferably be driven as soon as possible to the nearest medical facility such as a hospital that is suitably equipped to handle stroke cases. If emergency services where ambulances are available, the paramedics who come with the ambulance might even be able to render aid that might save the stroke patient’s life. Every minute counts and judgement has to be exercised on which is the most appropriate course of action to take. Some strokes go unnoticed or ignored because they only last a few minutes and the symptoms end. These strokes are called transient ischemic attacks (TIAs) and are also known as ministrokes. They are important because an untreated stroke can be followed by a major and disabling stroke within hours. It is to the patient’s benefit if treatments such as clot busting drugs are administered within the first three hours after the symptoms occur. The medical professional who is handling the situation will be suitably able to judge what should be given. According to the National Institute of Neurological Disorders and Stroke, the risk of suffering from a stroke increases by more than double for each decade of life after age 55. In addition, stroke represents 8 percent of all deaths among individuals age 65 and older, according to the Centers for Disease Control and Prevention (CDC). Ischemic stroke – This is the most common form of stroke in which the blood supply to the brain is interrupted or disrupted, leading to a loss of oxygen to the brain tissues. 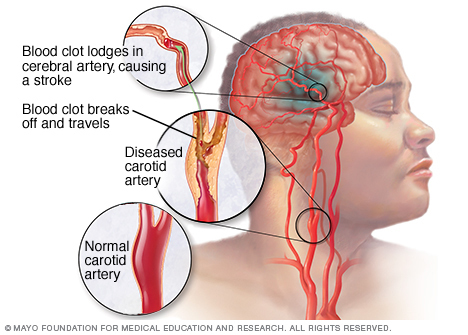 An ischemic stroke may result from arteriosclerosis (clogged arteries). Fatty deposits of plaque may build up on the arterial walls over time and eventually result in an abnormal blood flow, causing the blood to blot. A blood clot that stays in one place within the brain is called a cerebral thrombus while a clot that breaks loose and moves along the blood stream inside the brain is known as a cerebral embolism. An abnormal heart valve may also cause an ischemic stroke. Heart rhythms problems and severe alterations in blood pressure may also be responsible for a loss or reduced blood flow to the brain. 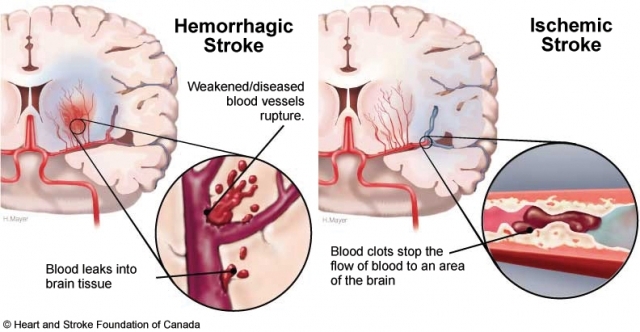 Haemorrhagic stroke – With a haemorrhagic stroke, a blood vessel leading to the brain or inside the brain bursts, resulting in the rupture of brain cells. Do not self-diagnose. At the onset of symptoms, please see a medical professional. Only a physician can diagnose a stroke accurately, determine the status of the stroke and decide on course of action. Medical professionals use imaging tools to determine whether a stroke has occurred and if so, the severity of the stroke. They may use a computerized tomography (CT) scan or a magnetic resonance imaging (MRI) scan of the brain. They may also use an ultrasound to image the carotid arteries of the neck in order to check for blockages or clots. Magnetic resonance angiography (MRA) may be used to determine and detect blockages of the carotid and vertebral arteries. Other tests may include an echocardiogram to ascertain if a clot from the heart has caused the problem or an electrocardiogram to identify any underlying heart or cardiovascular diseases. Laboratory test will be performed to determine if there is any abnormal clotting of the blood or if there are any autoimmune conditions. Medications are frequently used to treat stroke patients. Anticoagulants are often prescribed. The most commonly prescribed anticoagulants are Warfarin (Coumadin) and Heparin. Antiplatelet agents (drugs that prevent small blood components from sticking together) are also commonly used, including aspirin/extended-release dipyridamole (Aggrenox) and clopidogrel (Plavix). Calcium channel blockers and pain medications may also be prescribed. Intravenous feeding therapy is often instituted because the patient maybe unable or have difficulty in self-feeding. When the patient has lost the swallowing reflex, it is also unsafe to administer food via the mouth. Once the patient has recovered, he or she may be placed on long term aspirin therapy. Sometimes, in severe cases, surgery might be required to repair the damage caused by the stroke. Stroke victims may suffer long term effects and follow up care with a specialist like the neurologist maybe required. They may also need assistance with performing the activities of daily living (ADL). Examples of ADL include eating, dressing, toileting and so on. Stroke patients may need to receive care in a rehabilitative nursing home until they are well enough to receive care within their own home. Speech therapists, physiotherapists and occupational therapists can also be engaged to help the recuperation. Sometimes, stroke patients are also traumatized and also suffer emotionally from the fear of the onset of another attack and in most cases, the deterioration of the quality of life. Hence, they should also be cared for from the perspective of the psychological aspect. Individuals with high risk factors should be screened for hypertension and have their blood cholesterol checked regularly. Hypertensive patients should work to reduce their blood pressure to normal levels with a combination of medication, exercise, weight loss, diet and other recommendations provided by their physicians. Always remember this: Everything in moderation and seek your physician’s advice before going about on a regime to reduce your blood pressure. Some patients attempt to partake in strenuous exercises without consulting their doctor, leading to fatal endings. Follow us via facebook. We will post useful articles related to health care, fitness and of course, geriatric care!